Hello! It’s been some time since I ran a giveaway and I’m particularly thrilled about this this one. The holiday season is a time of giving and sharing. 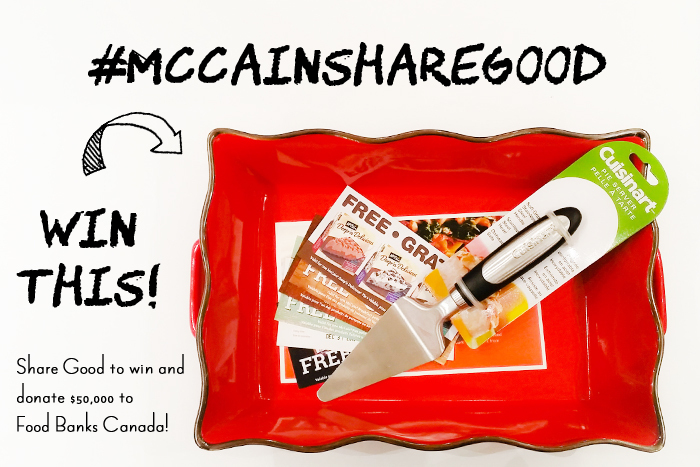 I’ve partnered up with McCain Foods on their #McCainShareGood campaign and giving you a chance to get involved and also win an awesome prize! We all know how much good can come from helping others, so this holiday season, McCain Foods wants to fill social media news streams with good news stories, to motivate more people to help support Food Banks Canada. From November 19 – December 23, McCain Foods is donating $5 to Food Banks Canada, up to $50,000, for every good news story shared using #McCainShareGood on Twitter or by tagging the McCain Foods Canada Facebook page. Share YOUR good news story with us and enter for your chance to win a great McCain prize pack! Watch the video and read further to see how you can participate! I’d love to encourage you help McCain and I raise up to $50,000 by sharing YOUR good news story! What constitutes as a good news story you ask? Family: Today my sister gave birth to a beautiful baby girl! Celebration: Celebrating my dad’s 80th birthday tonight. You’re my inspiration! 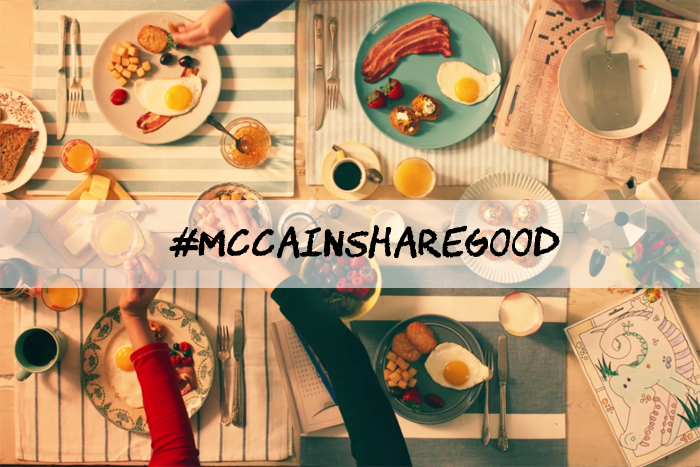 Participate in this #McCainShareGood Holiday Campaign for your chance to win: Up to $25 coupons for FREE McCain products, Tuscana Large rectangle fluted bakeware, Cuisinart Elements Cake/Pie Server. Here is how you can win, enter the draw by using the WIDGET below. Contest is open from November 27, 2014 12:00 a.m. EST to December 12, 2014 12:00 a.m. EST. This contest is only opened to Canadian Residents only, one winner will be selected to win a McCain prize pack valued at $50. Winner must provide a Canadian shipping address to receive prize. +10 entries by commenting below with your good news story! Wishing you the best of luck!! I hope you’ll join us in this movement to fill the plates of those in need and bring smiles to tables across the country!!! My good news story: I get to me a hand model on the cover of an album! Our good news is, affter being laid off last year, my Husband finally found a great job that pays well and has benefits. My mom after being ill for several years has been finally been given the go ahead to travel halfway around the world to see my grandmother (her mom) who is 96!! Finally was able to use my gift certificate! I needed to fill the car up and was very happy to see that the price has dropped so low, means I can purchase more McCain’s goodies when I do my grocery shopping tomorrow! For me the good news is that Christmas is on his way. I was able to work around my work schedule so that I will able to make it home for Christmas! My child used her own birthday money to buy craft supplies, made a pile of beautiful bracelets then set up a stand to offer her bracelets for sale with 100% proceeds to sick kids hospital! I’m almost done my first semester of school, and I haven’t gotten anything less than an 89%! I found a great deal on boxing day. I am getting a raise at work. Celebrating Mom’s 90th birthday next week! My Good news story is that most of our holiday shopping is done and out of the way. I got my husband the best Christmas gift ever on sale and he has no idea! I love that my family is so close! I would rather spend time with them than most of my friends. They are a joy to be with! I finally paid off my student debt! My good news is that I am almost done Christmas shopping, decorations are up and Christmas cards are sent out. My good news story is that I helped to stuff some homemade teddy bears that will be given to residents in a nursing home. I finally found the one I want to marry. 🙂 That is pretty awesome news!! got to take my wife out on a date away from the kids. We love them, but it was a nice break. My husband had a Heart attack and other issues and after two years he has got the clearance that he can go back to work. Such good news! I got into a competitive program at school! My good news this week is don’t have to see my cancer doctor for 6 months. My good news is that I am going to be an aunt since my sister is expecting! I am almost done my Christmas shopping! Yay! Our toddler is finally, finally using the potty! My good news story is that I have a new job lined up for next year! My cat recently had kittens! its been a rough week, but after nearly all my family members (and the baby sitter and my parents) getting sick, we are all on the mend!!! I’m going to send 30 boxes next year and I have a shelf full of new items all ready. I keep watching for sales. Next year is going to be great!